THE entrance of our home, whether we like it or not, makes a statement about us and our living space. It's the first impression that people get of our home, and such as, special care should be taken in the design to make it a worthy space and welcoming area for our family and guests. The entrance is normally a pass through area. Sometimes in an individual big house a spacious entry hall is provided for entrance. Often an entrance may be a corridor, or a stairway. However, a dark corridor can be turned into a lovely entry point by using light coloured paint or wall papers, or by adding large mirrors. Since it is the first area that people see in your home, it should be as inviting as one can make it. Colour: Colour is a vital consideration for entrances. There is no ideal colour chart for entrance. Some of our clients look for a cool, calm entry. Light colours brighten up a place, and lend it an illusion of spaciousness. If we want to make it a dramatic place, we can use wall paper or sponge paint. The picture shows lemon-sponge paint on the entrance wall. The entrance hall or corridor is also a good place to experiment. If you like bold colours, why not try it out in this space, as it is not a place where you spend much time. Floor ideas: If you want to create a look that dazzles, then the floor is a key point to consider. Entryway, hallway and stairway floors should be coordinated so they make smooth transitions from one area of the house to another. You do not necessarily need to use the same floor covering throughout the house, but materials should be planned so the colors, textures and tones make a visual connection. There are various types of moods you can draw as per desire. You can use parquet wooden tiles, or polished porcelain tiles, or a marble floor with a daring pattern. With these, you can blend rugs or shatranji, or may be a heavy-duty carpet. Simplicity and sophistication: Do you want to create an elegant formal foyer? Then please arrange the tone of ivory tiles or beige coloured marble as floor material for this particular area. The pictures show majestic green and beige marble squares spread across the floor, forming an open checkerboard pattern. The long-lasting beauty of the marble ensures that this entryway will maintain its elegant appeal for many years to come. 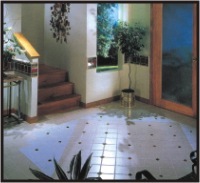 Clean, colourful: Ceramic tiles are a clever floor covering for this inspired entryway. A subtle tile design creates the effect of an angled area rug that greets people as they enter the room. Small, glossy colored tiles that match the look of the larger tiles on the wall are interspersed throughout the floor design. 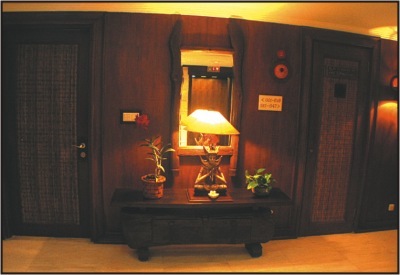 Lighting: In the entrance, lighting can be used to open up space and provide a hospitable environment for visitors. Through the use of proper lighting design, a dark and cramped entryway can appear spacious and become a warm and comforting area for guests. Entry lighting can also energize a person's impression of a home, highlighting a dramatic painting, sculpture or architectural detail. It draws attention to objects of interest and will simultaneously welcome and impress visitors. To make people feel more comfortable in an entry with a very high ceiling, install translucent wall sconces. This will create a secondary ceiling line that gives the desired human scale and makes the space feel less intimidating. Reflecting light from the ceiling will help make low ceilings seem higher and small entries seem larger. Lighting a painting mounted on the wall along the stairway, or illuminating plants or a sculpture on a stair landing, can also help a small entry assume the appearance of a grand entrance hall. Switching and dimming systems can take the same entry that was made to look dramatic for a big party or event and instantly transform it into an intimate greeting area for small gatherings. Lighting can and should be that flexible. By using an integrated dimming system, homeowners can create whatever kind of setting and tone they would like. Lighting can be used to set the mood and even provide timing cues for the evening's activities. Furniture: The entrance hall or corridor is also a good place to experiment. 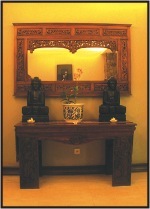 An oriental design console table with beautiful painting can be used in the entrance. If you have a little more space you can arrange two Victorian chairs beside the console table. This table can be used for storing keys, mail or simply displaying small decoration items. 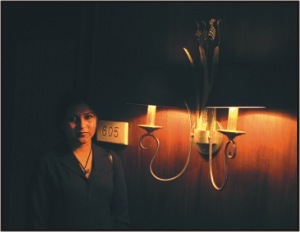 Not all lighting solutions directly involve the use of luminaries. 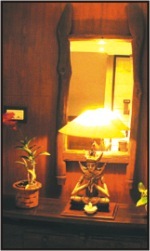 Mirrors, for example can be used to create the illusion of greater space. If your entrance is a narrow corridor, you can arrange long horizontal art pieces on the walls, place a traditional carpet runner on the floor, and emphasize the flower arrangement at the end of the corridor to create a warm welcoming entry. 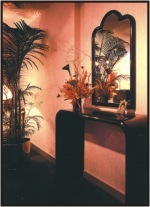 The decor of entrance can differ from person to person. This is a place where individual mood is reflected. Think of the entrance as a preview to the main event of our home. It is a taste of things to come, where we live, and our heritage and culture.